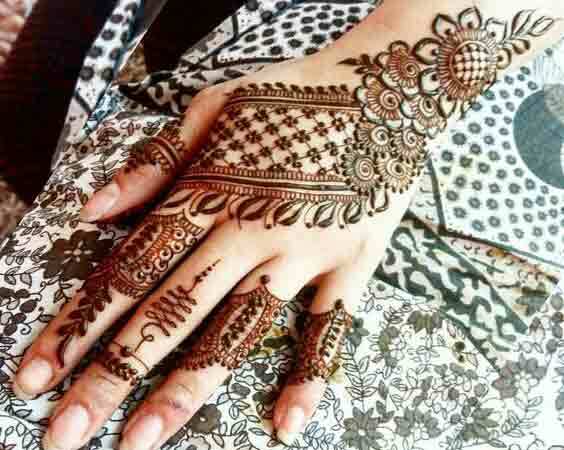 Do you want to apply beautiful and easy Eid mehndi designs at home? 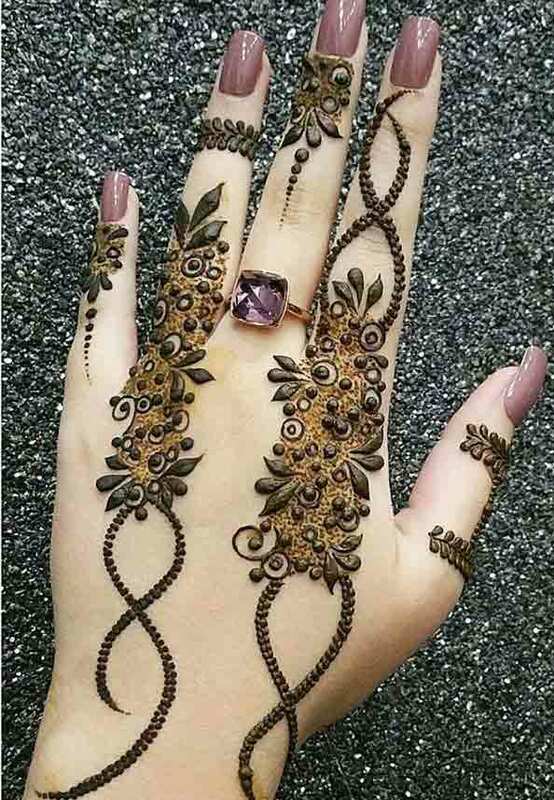 Today, I have brought you the new styles of extremely simple mehndi designs that will take your minimum time to apply and it will certainly leave everyone awe-inspiring. 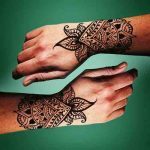 So, get ready to try the unique and easy Eid mehndi designs for hands! 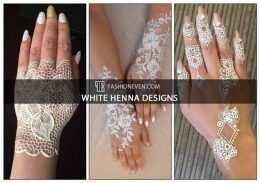 In this article, you will see only simple mehndi designs for hands that really won’t require any intricate designs or artistic skills. Even a beginner can do well! 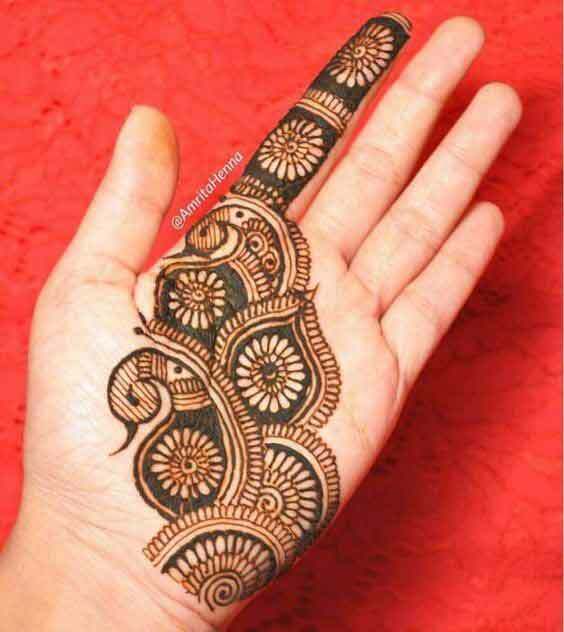 So you can say that on this Eid, you will find the easy mehndi designs for beginners. 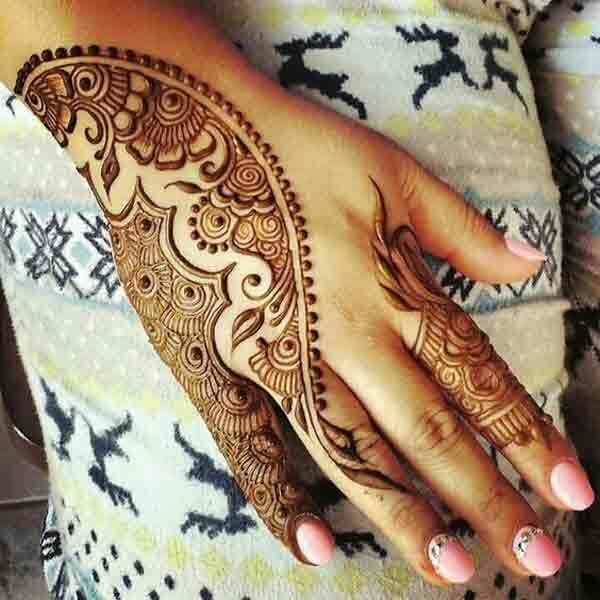 Let’s have a look at the variety of henna designs that will make you stand out from the crowd. 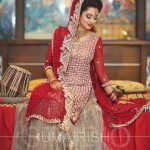 Do you want to try Pakistani mehandi designs? Have you seen the most beautiful mehndi design pictures that can influence everyone around you? 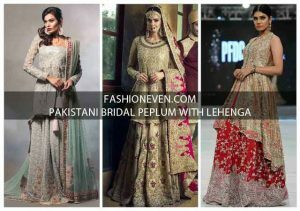 Must go for the Pakistani mehndi designs for Eid and get inspired! 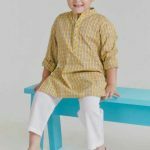 Show off your style on this upcoming Eid festival with the unique and elegant Eid mehndi designs for girls. No one loves to apply same old henna patterns every time. 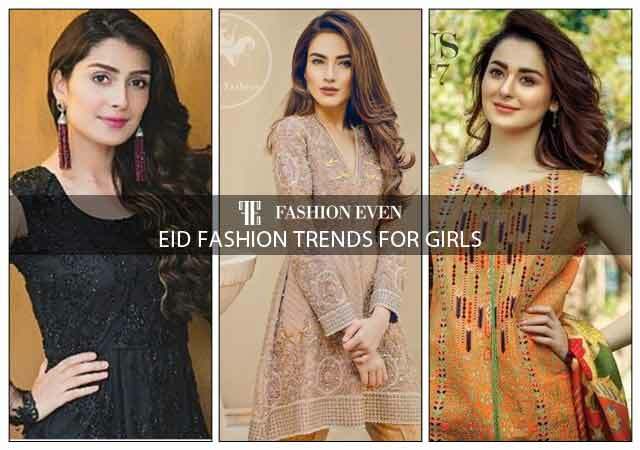 Now people see the world differently and try to excel by following the latest Eid fashion trends for girls in Pakistan. 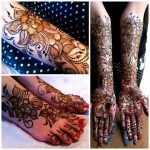 In order to achieve beautiful mehndi designs, first of all, you need to practice some of the most important basic henna patterns such as swirls, peacock designs, flower bud, hearts, stars, fish, netting, paisley, check, floral art, crossed lines and so forth. 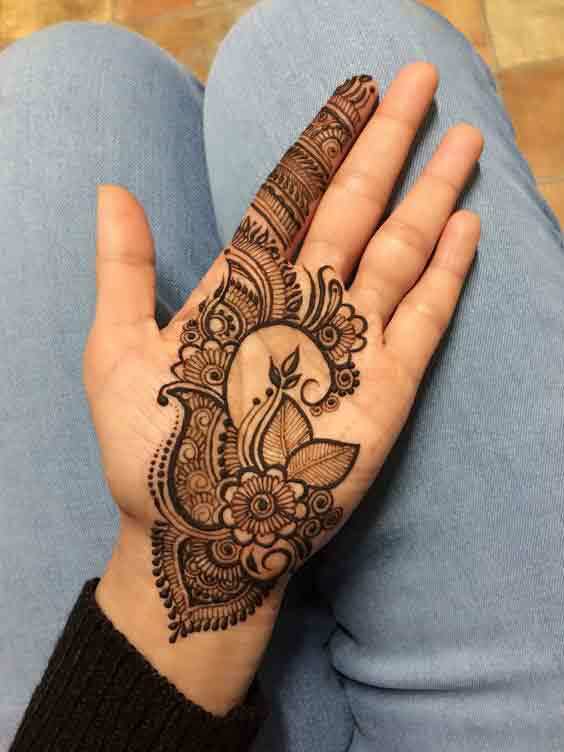 If you want to apply mehndi like a professional henna artist, then you may practice the easy henna designs (for beginners) on your hands, feet, arms, or even on a mirror! 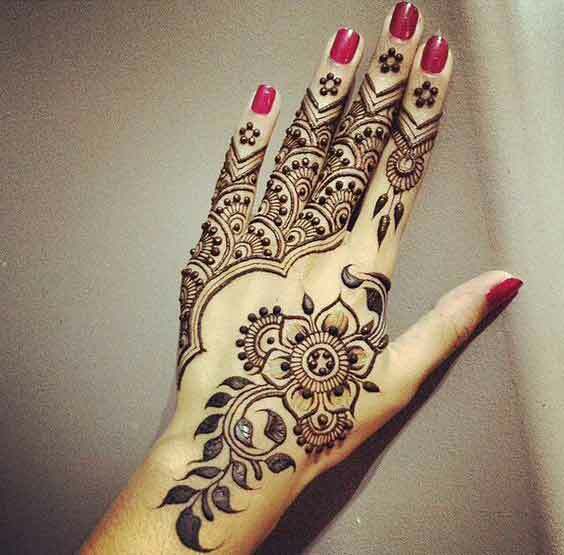 Scroll down to check out the easy Eid mehndi designs for girls! If you want beautiful yet easy mehndi design to apply on your front hand side, then go for the selfsame henna pattern as shown below. You need to apply the exact floral design every time until you cover your index finger. 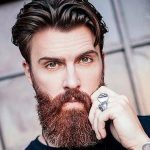 Plus, you may add some swirls and lines to enhance the attractiveness that interests. 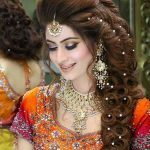 Here comes the most beautiful and easy Eid mehndi designs for girls! Draw a flower with some leaves and do not forget to sprinkle the cute little dots and swirls to reflect the twinkles. Cover the most of your palm area and keep drawing out until you complete your index finger. Leave the rest of your hand as it is and voila, you are done! Do you love the art that is close to nature? 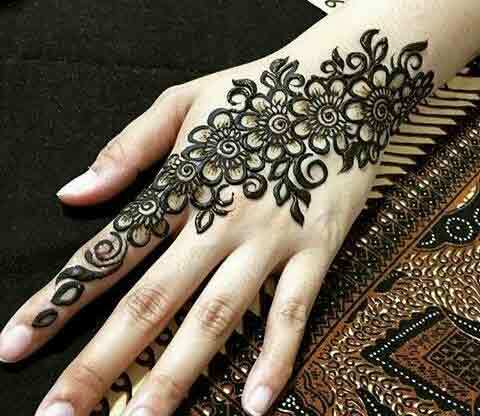 If yes, then the vine mehndi design for Eid is certainly for you! You may apply the same design on your front hand or back hand side. 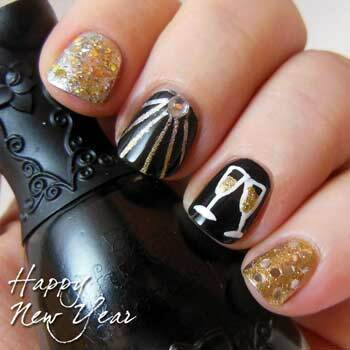 Make sure to stick with the simple design for your index finger. Do not fill in the petals and leaves but keep your focus on the thick outline. 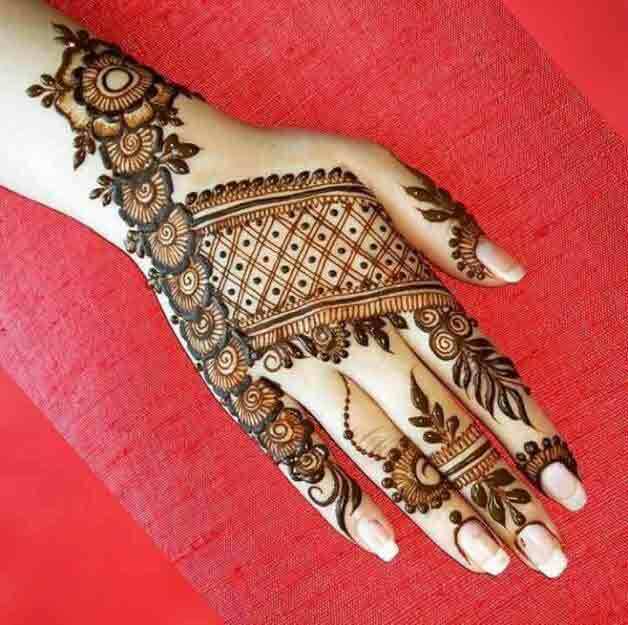 If you want to grab the attention of everyone around you, then endeavour your best-loved and beautiful Eid mehndi designs for the back side of the hand. I have gathered the mesmerising styles of simple mehndi designs for girls to apply on the back side of their hands and inspire all. If you are a beginner, then make sure to choose the easiest one! Sometimes it really looks awkward when you have no idea about how to apply henna and everything just go messy and chaotic. 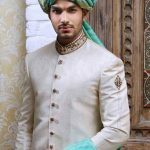 Go for the following Eid mehndi designs images and you always have the option to alter the design according to your choice and ease. As its name shows, this floral mehandi design is enduring and continually recurring. Draw a modest and beautiful pattern of flowers in line and make sure to add some hollow leaves all around the flowers to enhance the overall design. 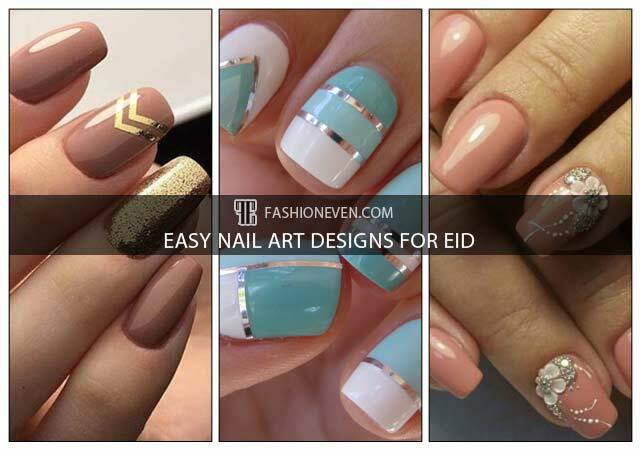 You may add glitter gel that matches your new Eid dress. 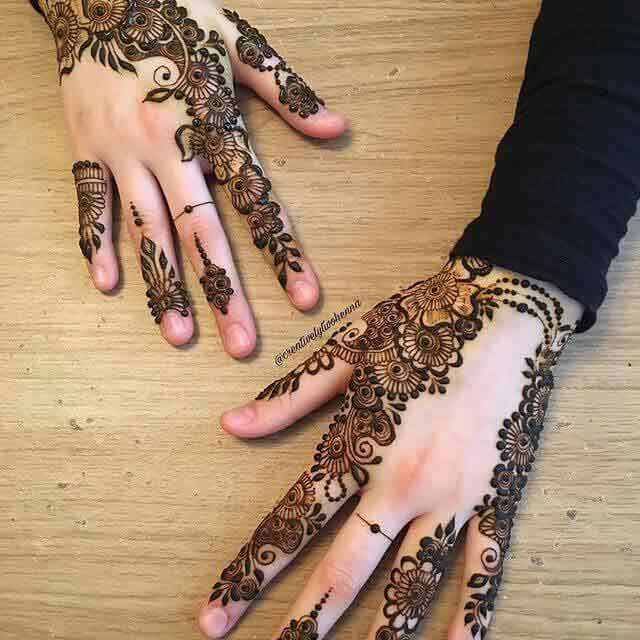 Do you want to apply the quick and easy Eid mehndi design? 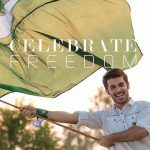 Have a look at the following design! It may appear complicated but this design is just as easy as you desire. Draw a significant flower along with filled leaves all around. Apply almost same pattern on all of your fingers and try for a unique style for the index finger. The key point to achieve this design is to draw the elegant thin lines while incorporating big thick dots. Get ready to try this unique combination of beautiful flowers and crossed lines mehendi design for Eid. Start from your wrist by making a beautiful flower with hallow petals and leaves. Draw a bunch of little identical flowers on the back of your hand. Follow the pattern as shown below. 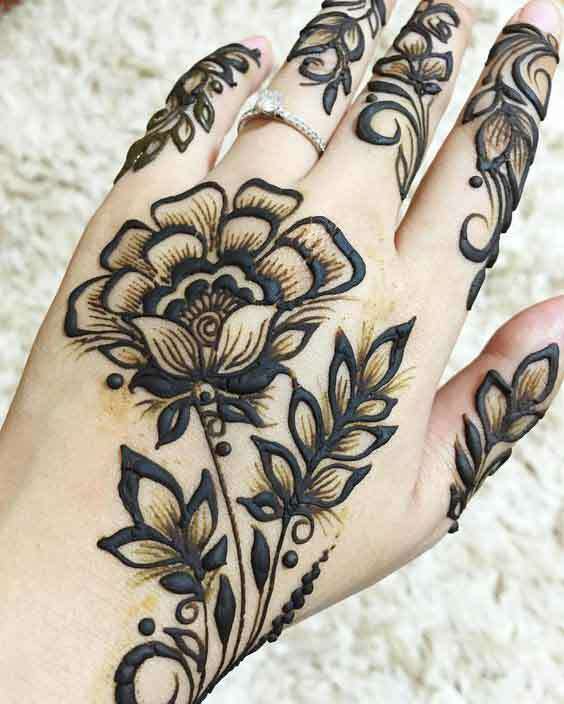 If you want to look refreshing during this hot summer season, then opt for the following thick and beautiful flower Eid mehndi design. 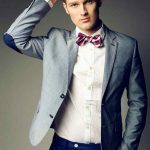 This crafty pattern may look complex, but in reality, it is really very easy to achieve and require just a little effort and practice. Must give it a try at least two to three times and you can do wonders. Rest assured. Draw a beautiful big flower on the back side of your hand. Make sure you are applying mehndi relatively dense in consistency so that the color of henna will be more appealing and you can enjoy it for a longer time period. 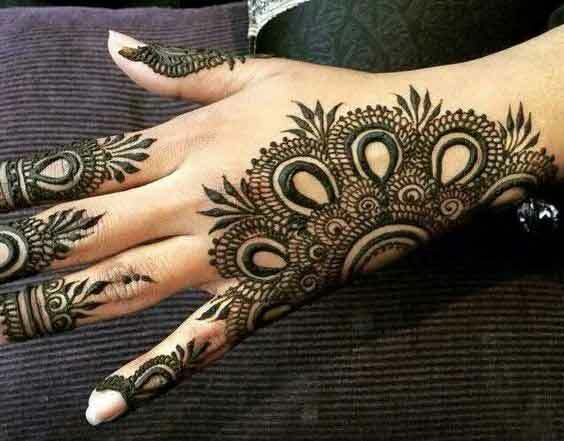 Do you love Arabic mehndi designs for Eid? Try out the following design and make sure it’s thick enough to get the better results. Thick leaves and swirls will make this design more captivating and eye-catching. Don’t you want to go into details? Do not fret at all! Check out the following pattern, it is as easy as you can see. Make two immense floral patterns at the wrist. Separate those flowers by drawing a thick line between them. By making vortices and leaves, continue straight to your index finger. To add an alluring beauty, you may create a design on your ring finger. This beautiful mehndi design for Eid is super easy to create. 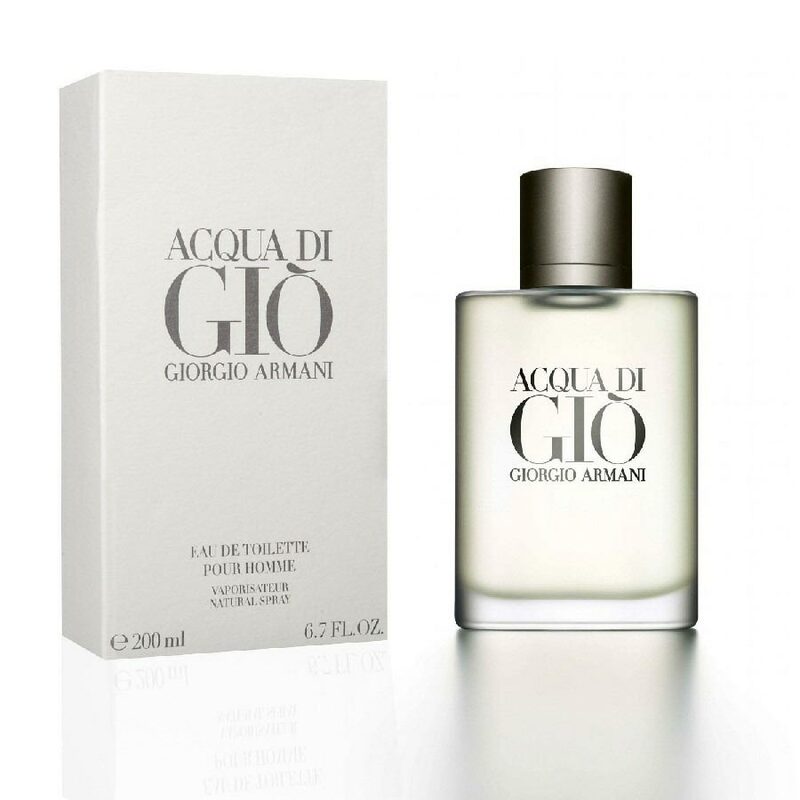 As its name shows, you have to make rhythmic twirls on the back side of your hand. Keep it as simple as possible and follow the pattern as shown below. Do not forget to make beautiful twirls and thick leaves on all of your fingers. Here comes one of the easiest and simple Pakistani mehndi design for Eid. 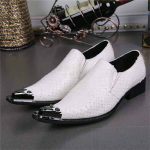 If you really want something unique but do not have enough skills and time to sit down and draw complex patterns, this is certainly for you. Make a simple and cute flower in the centre of the back side of your hand. Create a leaf-pattern on your wrist, index finger and middle finger. For embellishment, you can make small-sized whirls around the one side of the flower. 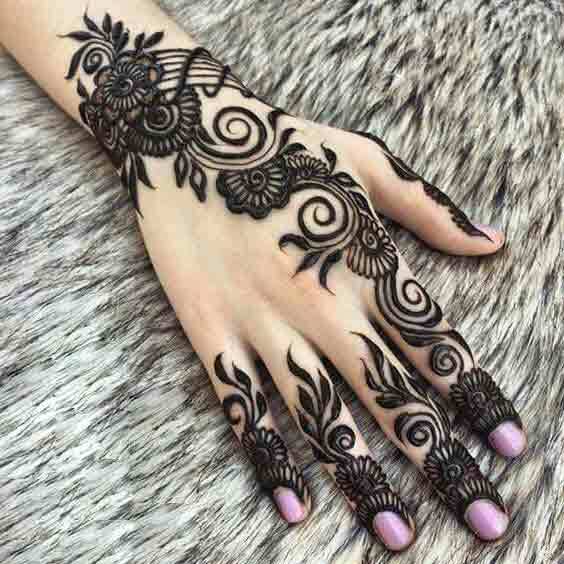 Check out the unique shaded Eid mehndi design for girls. The easiest way to achieve this shaded mehndi design is to create the outline first and then fill in the hallow areas of flower petals and leaves. Create design only on the index finger to finish the look with elegance. 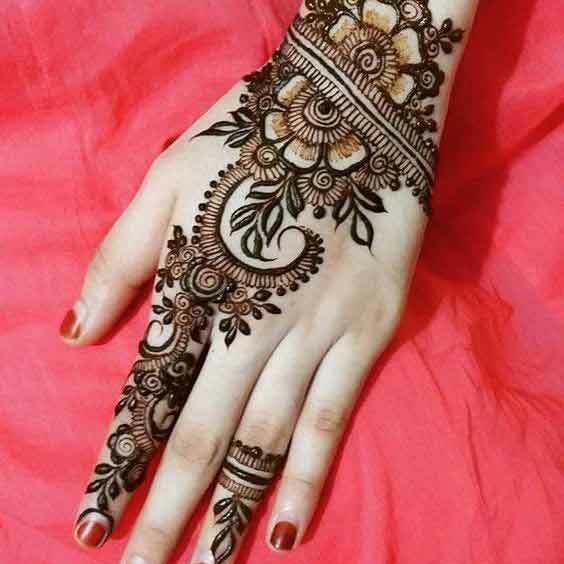 If you love to have simple yet beautiful mehndi design for this Eid, do consider the following henna design that is super attractive and pleasingly sweet. 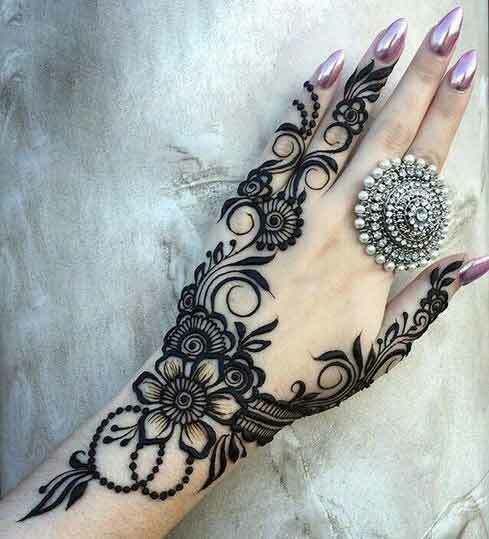 Try out this beautiful mehndi design for Eid. The secret of this mehndi style is to draw an outline first, keep it neat and clean as it will enhance the overall charm. 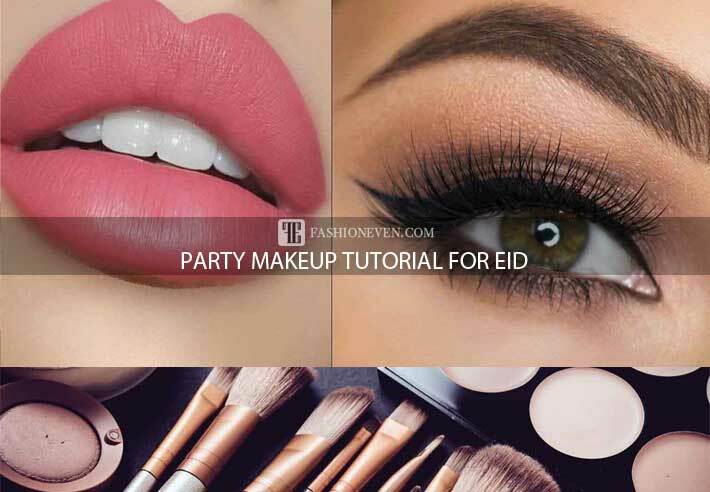 This design is so easy to achieve if you will practice it several times before the Eid special day. 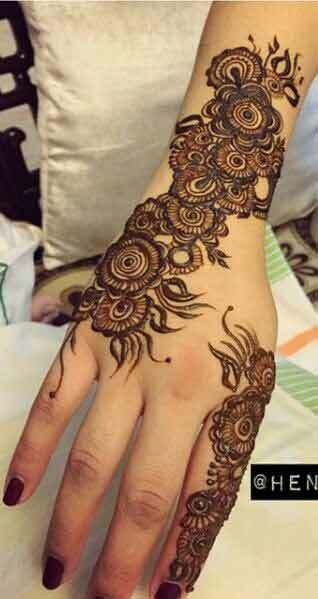 Here comes the another beautiful Eid mehndi design for girls in Pakistan. Go simple yet voguish with the combination of this floral pattern and intersecting lines mehndi design. Draw a beautiful floral pattern starting from your wrist and continue by covering your little finger. The thicker the flower petals, the more this design will be captivating. Create intersecting lines in a rectangular pattern as shown below and soon afterwards embellish the whole design so it will look pleasantly beautiful. Do you want to keep your Eid mehndi design simple yet artistic? Why not try out the easy finger mehndi designs? Let’s be unique and creative this time. 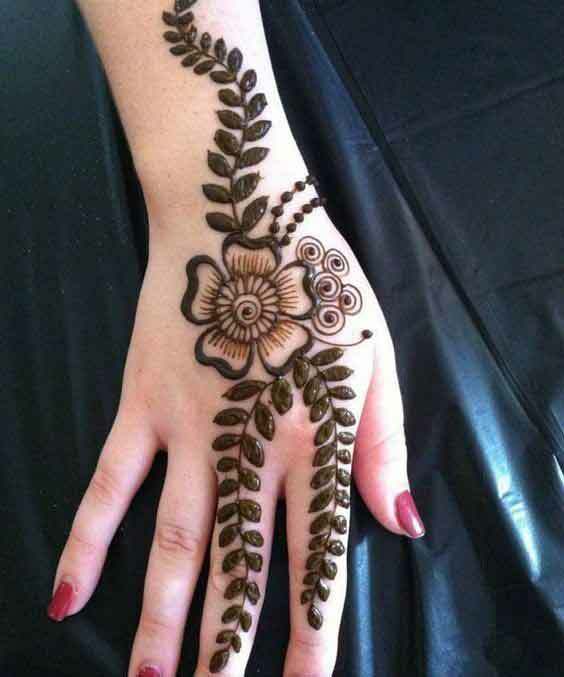 Draw a mixed pattern of thick and shaded mehndi style on the back side of your hand (as shown below). It will also look nice and decent if you won’t add plenty of dots. Are you still confused about how to apply Eid mehndi design at home? I can understand the disarray! For that reason, here I have got you the easy and beautiful mehndi designs for Eid step by step video tutorial. Practice makes a man perfect, you just need to choose your dearest new mehndi design and practice the identical pattern several times. 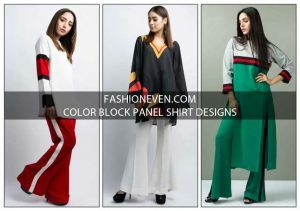 You will get the best result after few tries, rest assured! 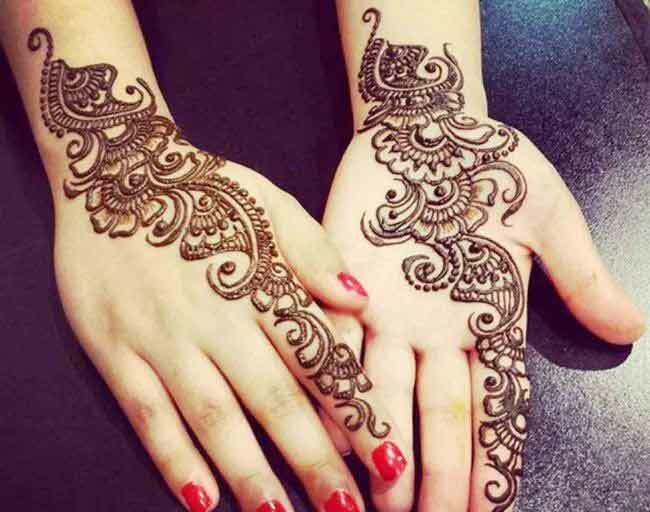 Have a look at the easy and simple new mehndi designs for hands! 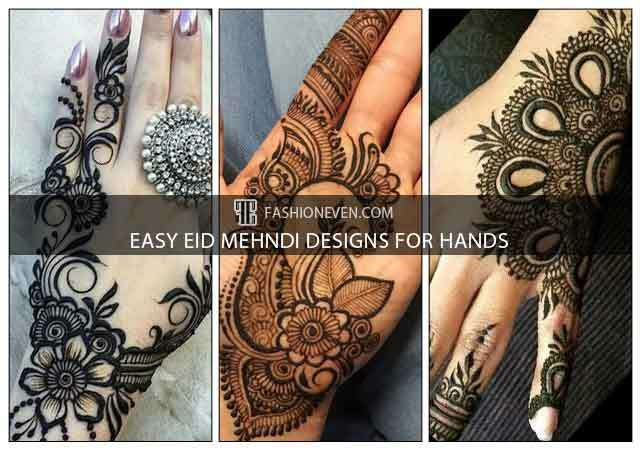 Choose your favourite latest mehndi designs for Eid (as shown above with images for front and back hand side), and practice the identical henna patterns at least two to three times before the special Eid day. 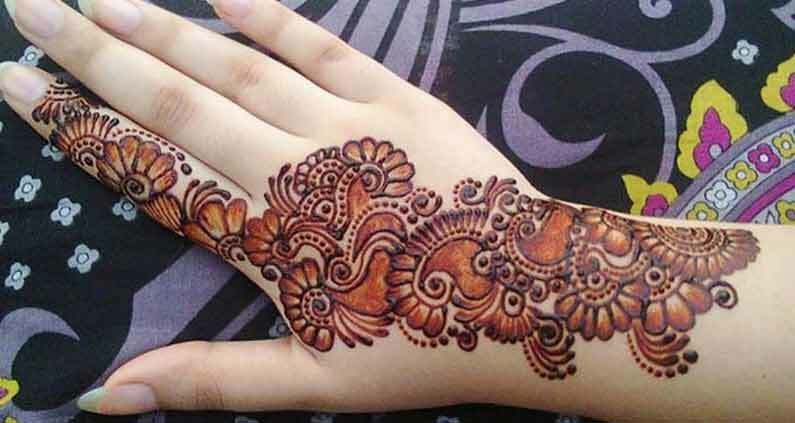 Above you have seen the latest styles of easy Eid mehndi designs for girls. 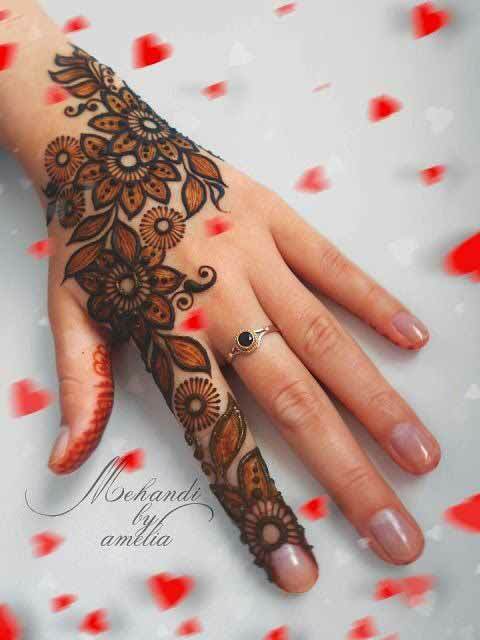 I hope that you must have got some idea about eid henna designs for hands (front and back side of the hands). Pick your favorite one, try it out and share your experience with me. 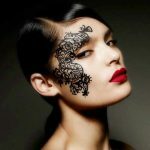 Keep visiting www.fashioneven.com for more free Eid mehndi designs and inspire everyone around you.